I call this the photographer’s DIY walking tour of downtown LA, but you you don’t have to be a photographer to benefit from this self-guided tour of the highlights of downtown Los Angeles (DTLA). 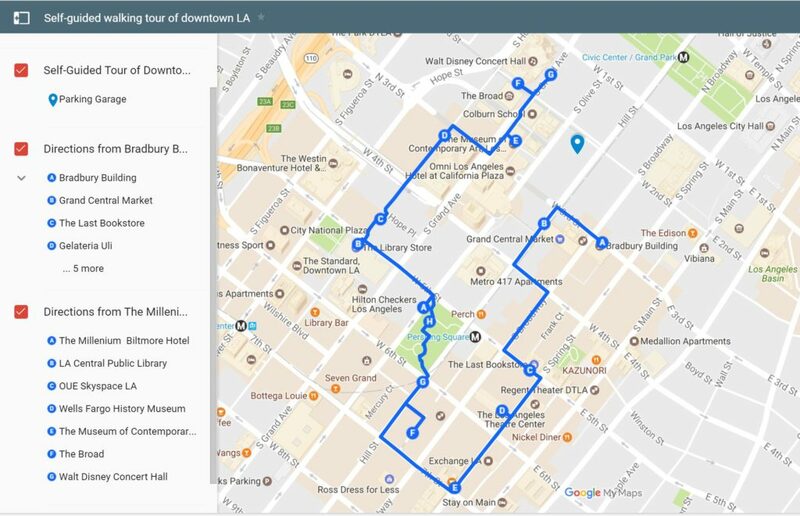 Here I offer you a route with stops along the way at some of DTLA’s most popular locations. At each one, I’ve included some shots to give you a visual sense of what to expect. As a photographer, I always wonder before a trip about what I’ll find in a new location from a photographic perspective. It’s fine to read about where to visit, but actually seeing it ahead of time helps clue me in as to how to spend the precious time I have in a place. Hopefully, the following shots will help you as well. At the end of this piece, I’ll include a list of some specific photography tips to consider for shooting the places on the walking tour. 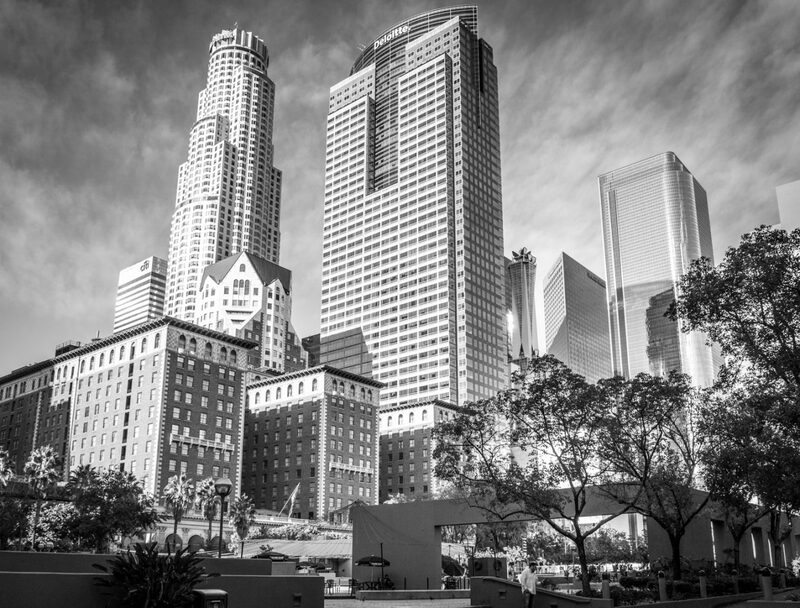 Downtown Los Angeles offers travelers and photographers of any level (and yes, if you have and use the camera on your phone, that includes you) a wide range of subjects. 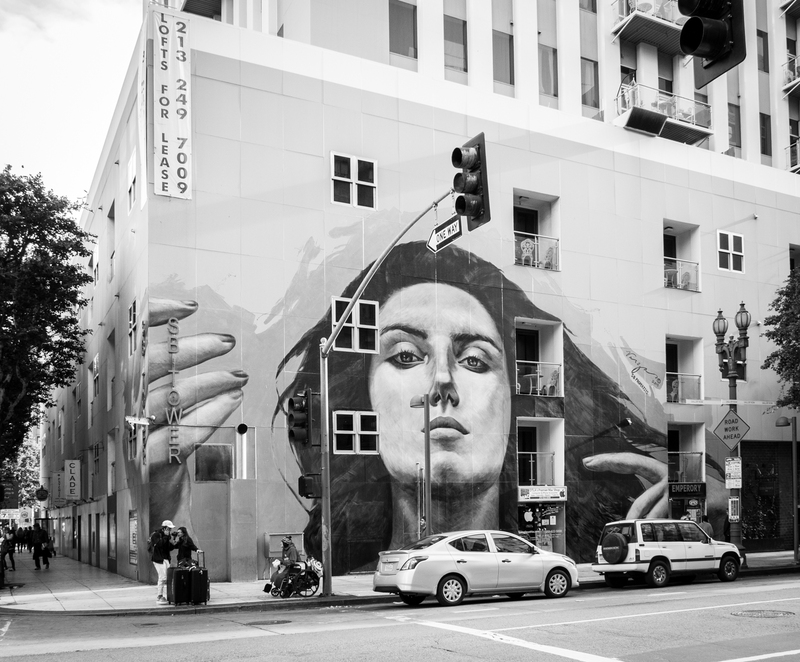 DTLA’s still in an ongoing phase of renewal (some might say gentrification). As a result, you’ll find homeless shelters and million dollar condos all within a few blocks of each other. 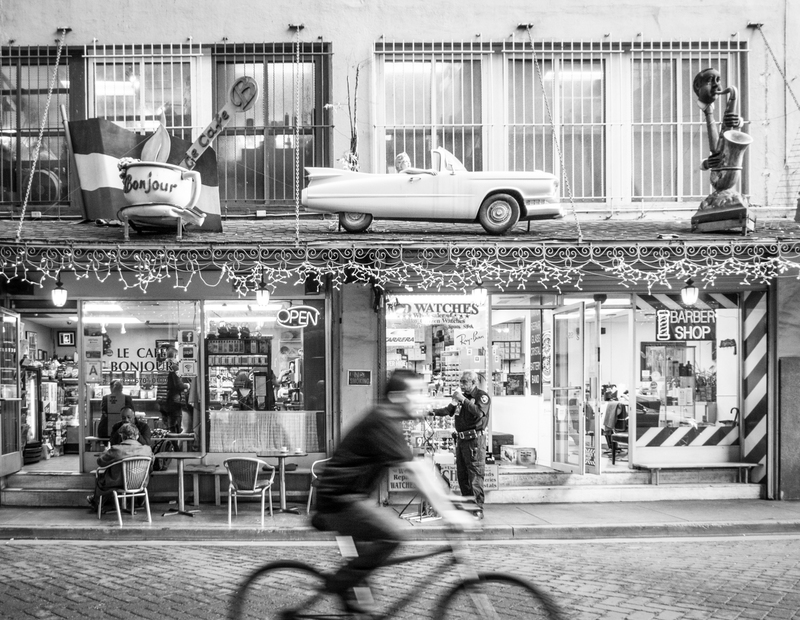 For the street photographer, this means an endless variety of faces, scenes and activity. For landscape photographers, you won’t find unspoiled vistas. This is, after all, the second-largest city in the US. 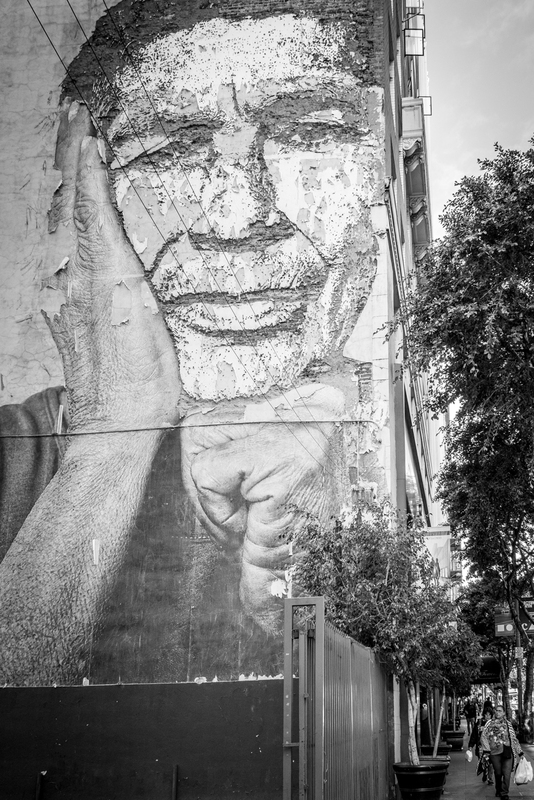 But you’ll find cityscape opportunities that combine the California vibe with one of the most exciting street mural scenes around. And if architecture is your thing, you’re surrounded by over 100 years of various styles. The following walking tour can be done in a half day or you could take a full day, go at a slower pace, and spend more time at the museums. I’ve based this tour on one I did the week before Christmas (hence the holiday decorations in the photos). My two sons and I started around 11:30 a.m. on a Thursday and ended at 4:30 p.m. Your mileage (and pace) will, of course, vary. The following map shows the whole route starting at the “A” near the center of the map near 3rd and Broadway. The lettering repeats itself after “I” since Google Maps only allows ten stops on the map. 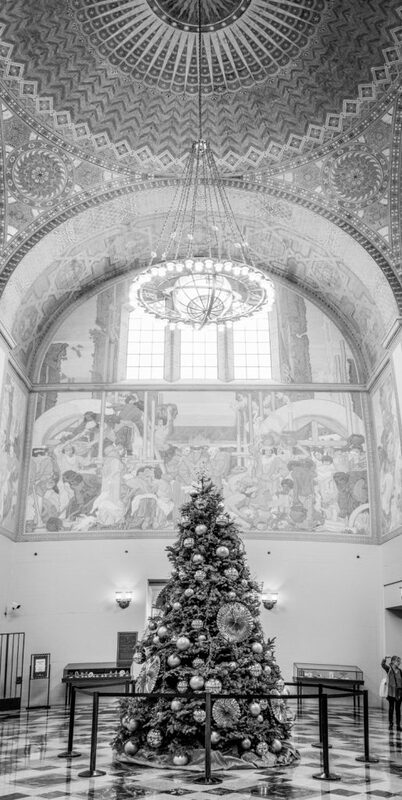 Thus, you’ll end the first half of the tour and begin the second half at The Millennium Biltmore Hotel. In general, you’re following the map roughly in a clockwise direction. In terms of getting there, LA is known as a driver’s city. Most people therefore expect that without a car, you can’t do much. They would be wrong. If you don’t want to drive, check out this helpful article on public transit and other options for getting around LA. Since we had a car, we parked at a garage on the corner of Hill and 2nd Streets. It’s very convenient and the rates weren’t bad ($10 maximum versus a few open lots we saw later for as little as $8 or as much as $24). It’s just a few blocks to our first stop on the tour, the Bradbury Building. Start your walking tour at (the first) Point A on the map, The Bradbury Building on 3rd and Broadway, the oldest existing commercial building in the downtown area. This iconic building has shown up in numerous films and TV shows. 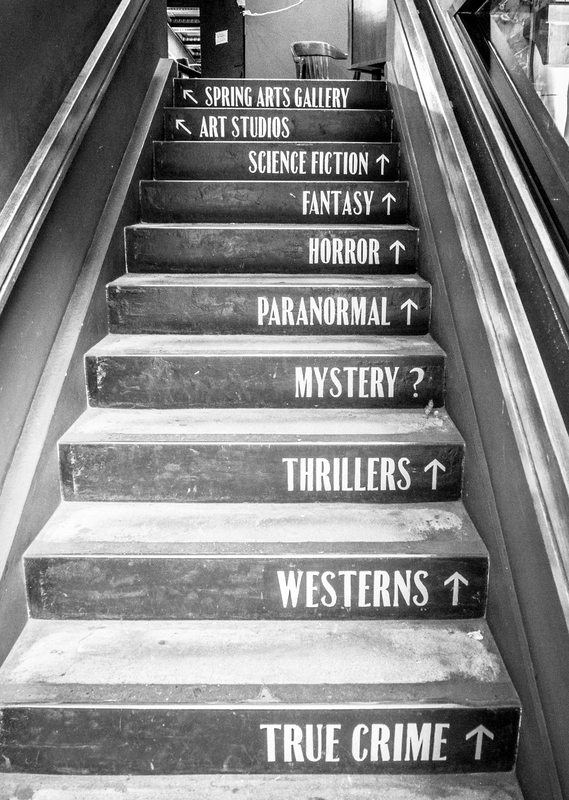 Unless you have business there, you’re limited to the ground floor and the first set of stairs. There are tours, however, that will explain the history and show you more. Before you enter one of the two entrances, look across 3rd Street for this mural. 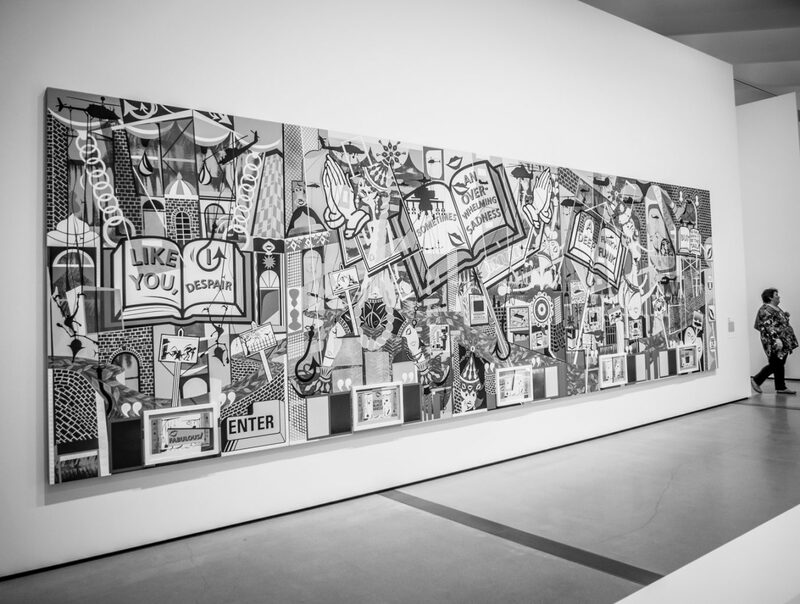 It’s one of many enormous works of art you’ll encounter on your tour. 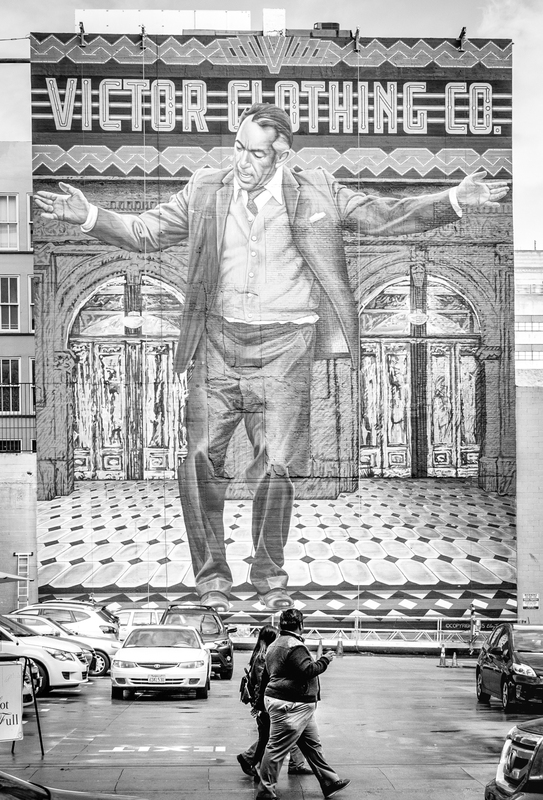 Check out this wall mural across from the Bradbury Building. Look familiar? 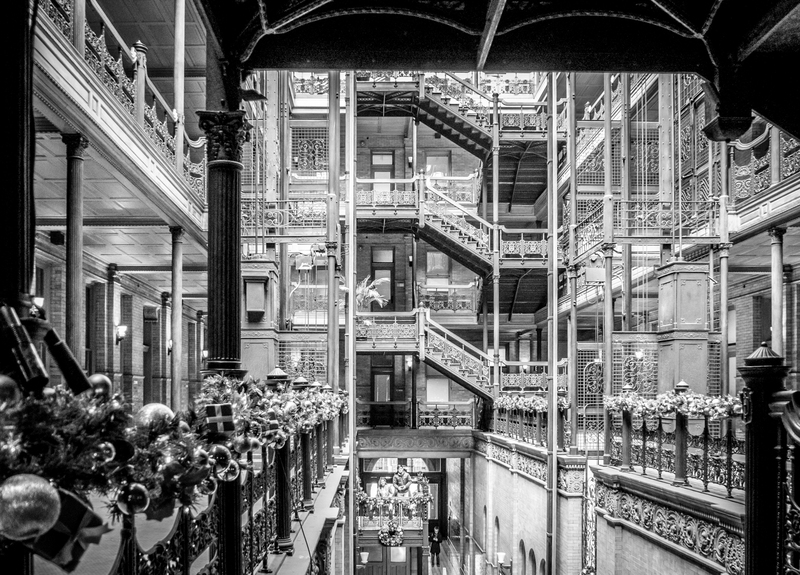 You’ve likely seen the Bradbury Building in movies like “Blade Runner” and many others. Look up! 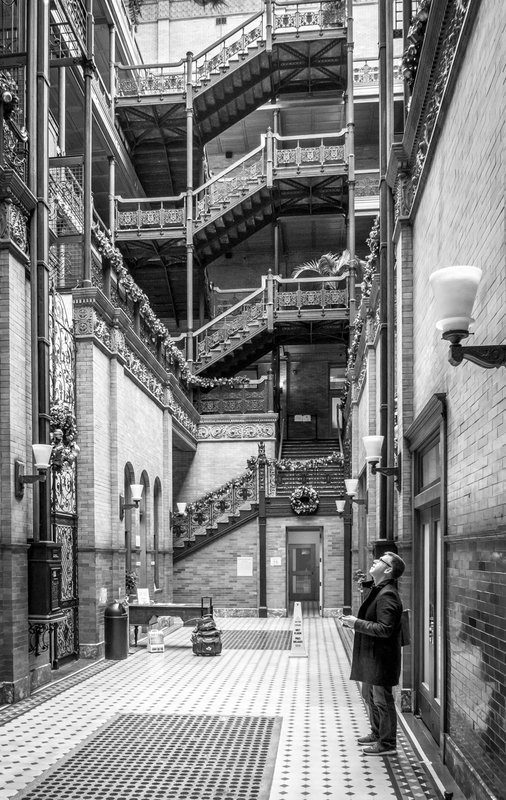 There’s much to see here at the Bradbury Building. Cross Broadway from the Bradbury Building and you’ll see one of the entrances to the Grand Central Market. 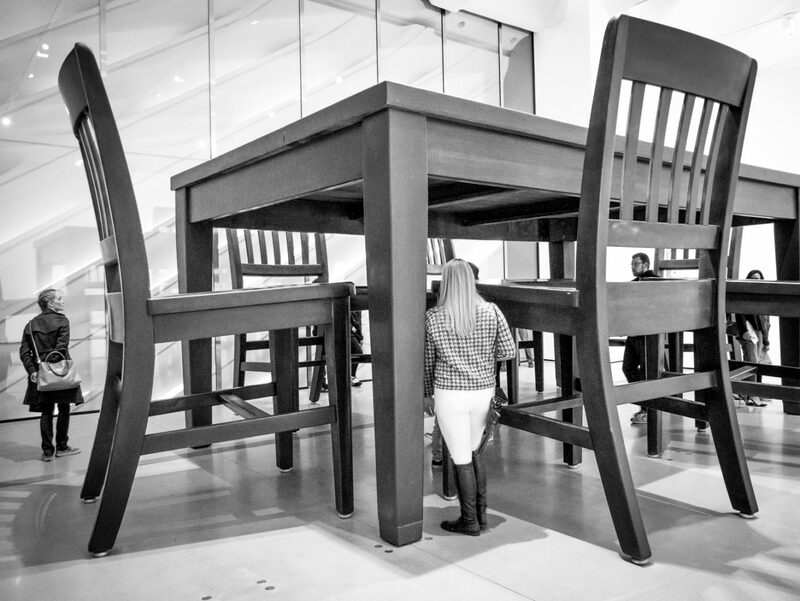 If you can, time your visit so you end up here for lunch (or breakfast or dinner or…). The market sells produce, spices, baked goods and even has a dollar store in the basement. But most people come here for the food stalls throughout. 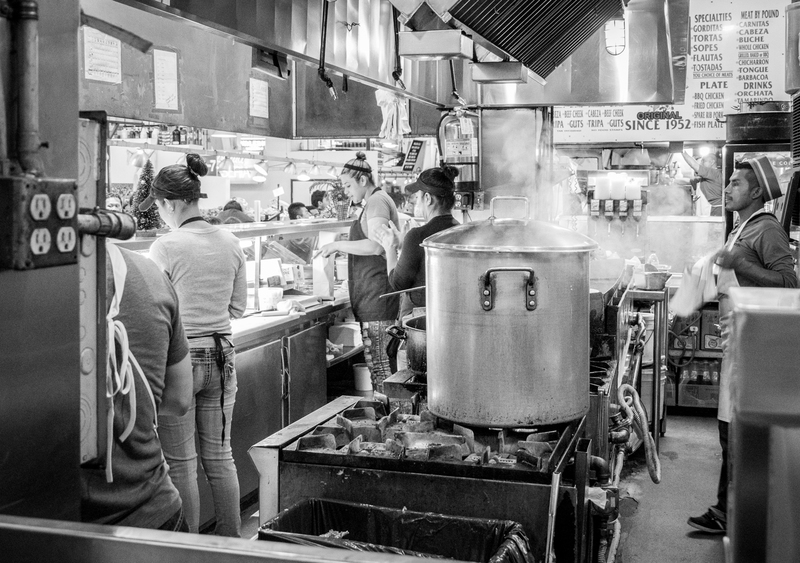 The variety of food choices can be daunting from Asian, to Italian to plenty of great Mexican and even a German place thrown in for cultural breadth. 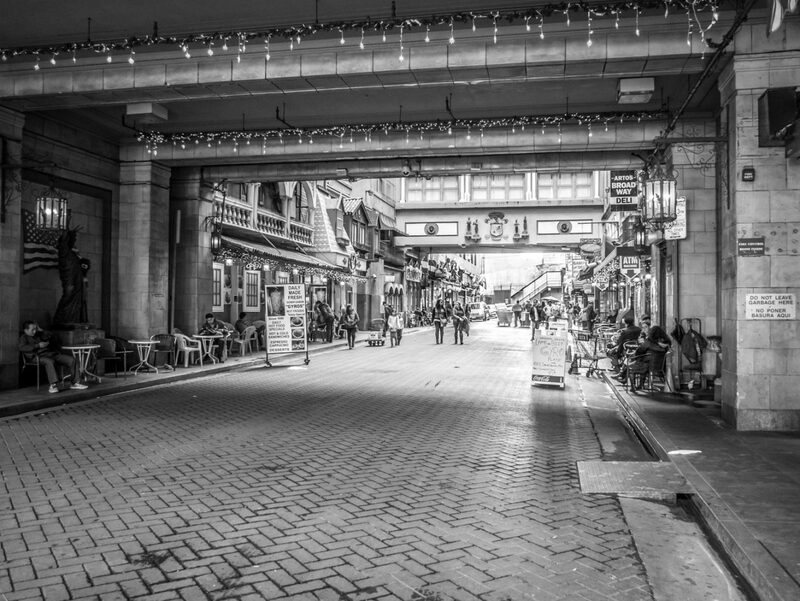 Wander the place first to see your choices, then grab your food and find a table anywhere in the market. When we were there, I had two tacos from Ana Maria and they gave me extra tortillas since there’s enough meat in each for 2-3 normal-sized tacos. Exceptional. 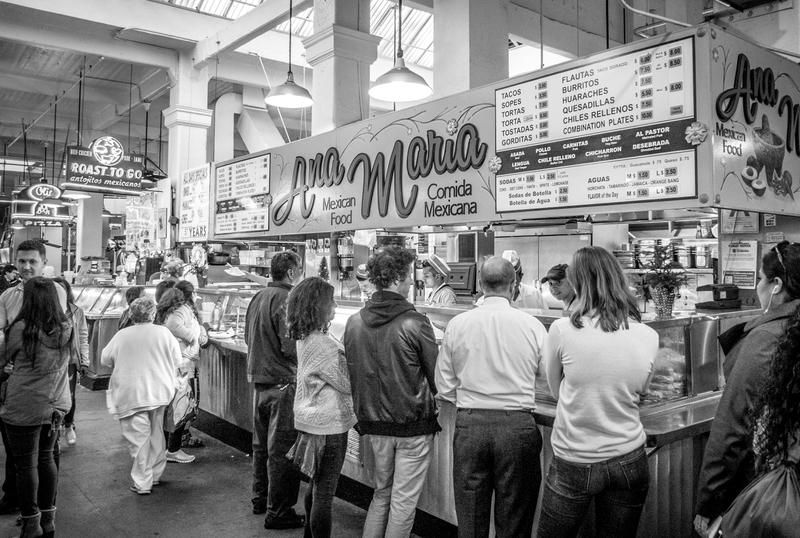 Ana Maria’s at the Grand Central Market. A single taco could easily be enough for lunch. After the market there’s a quick side trip you can take. 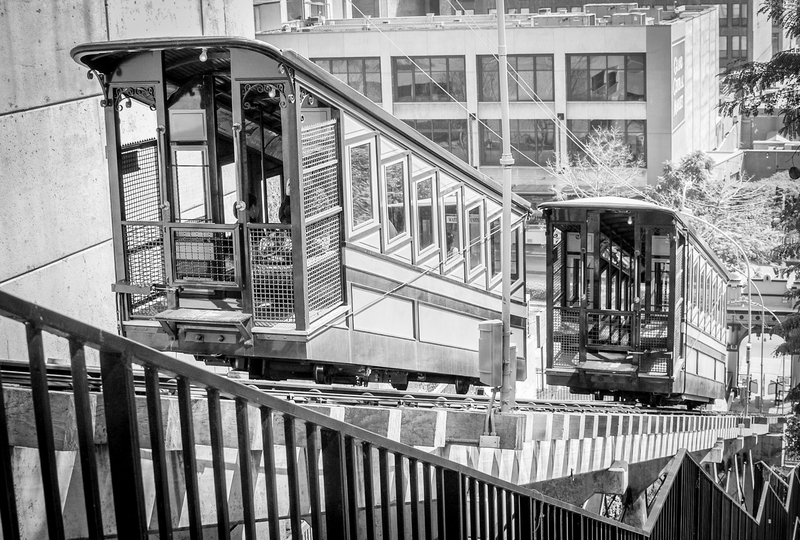 On Hill Street almost across from the Grand Central Market is Angels Flight, the little funicular railroad that travels a whopping 298 feet up Bunker Hill. I haven’t included it as a stop on the tour since it has been closed since 2013 due to an accident and some safety concerns. 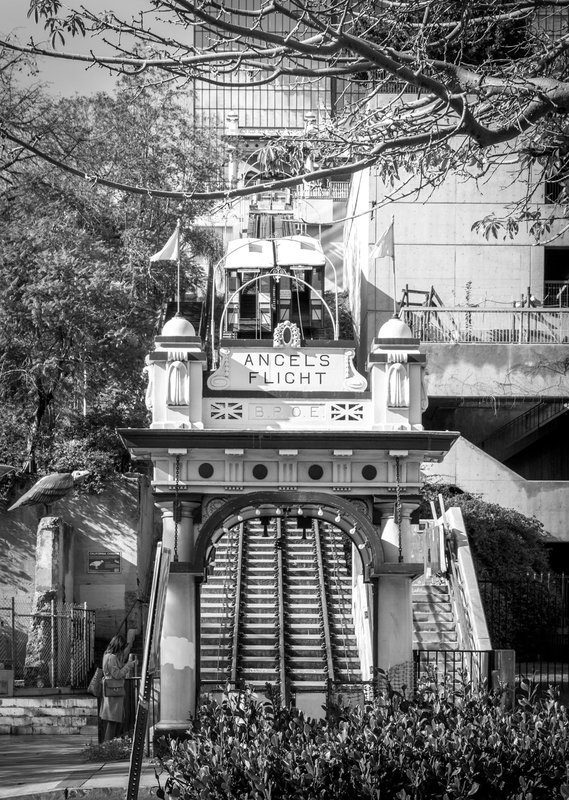 The first photo below is from March 2011 when Angel’s Flight was still running. The photo after that was shot in December 2016 showing what it looks now in its suspended state. It’s worth taking a look if you have time even if you can’t ride it. 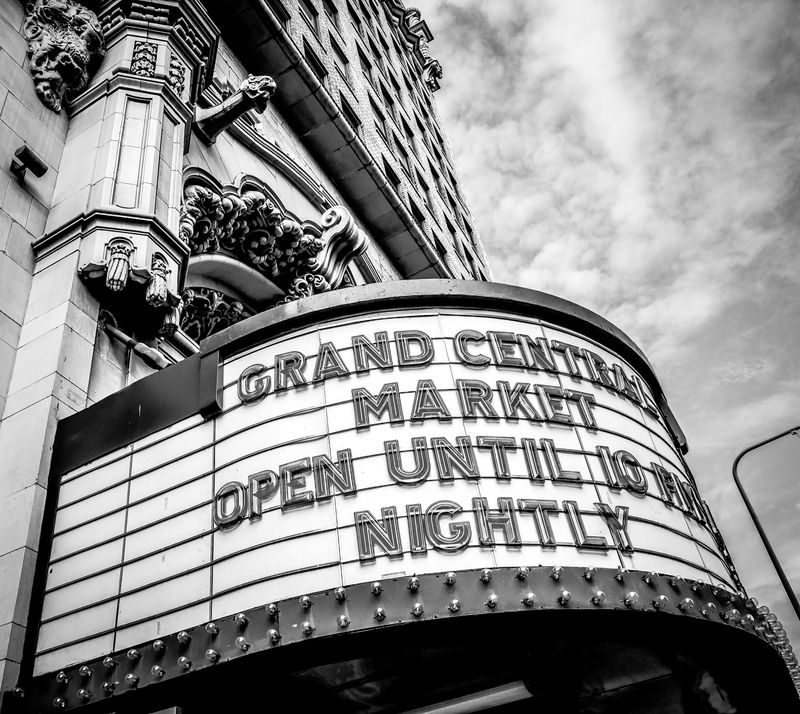 Depending which exit you use from Grand Central Market (there’s one on Broadway and one on Hill), walk down to 5th then head south on 5th Street to the corner of 5th and Spring. There you’ll find The Last Bookstore (point C on the map) on your left. 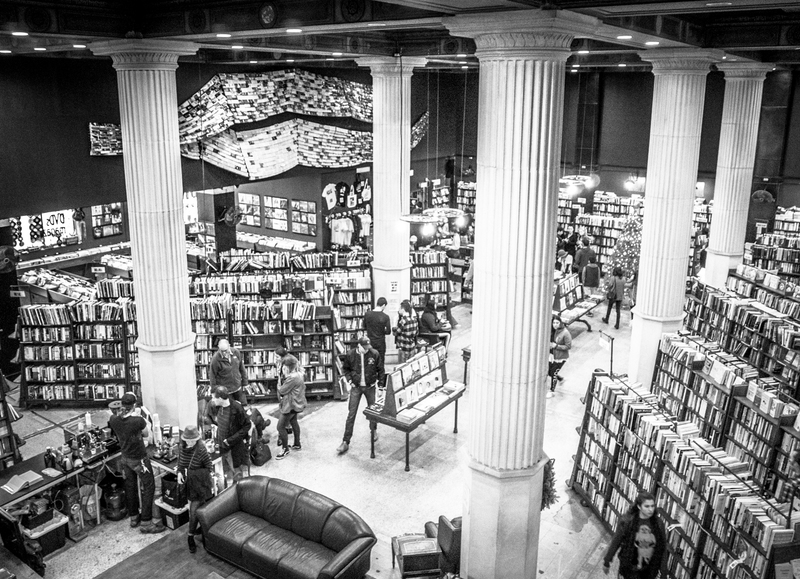 Opened (in a smaller venue) in 2005, the name derives from the apparent fate of independent bookstores at the time. 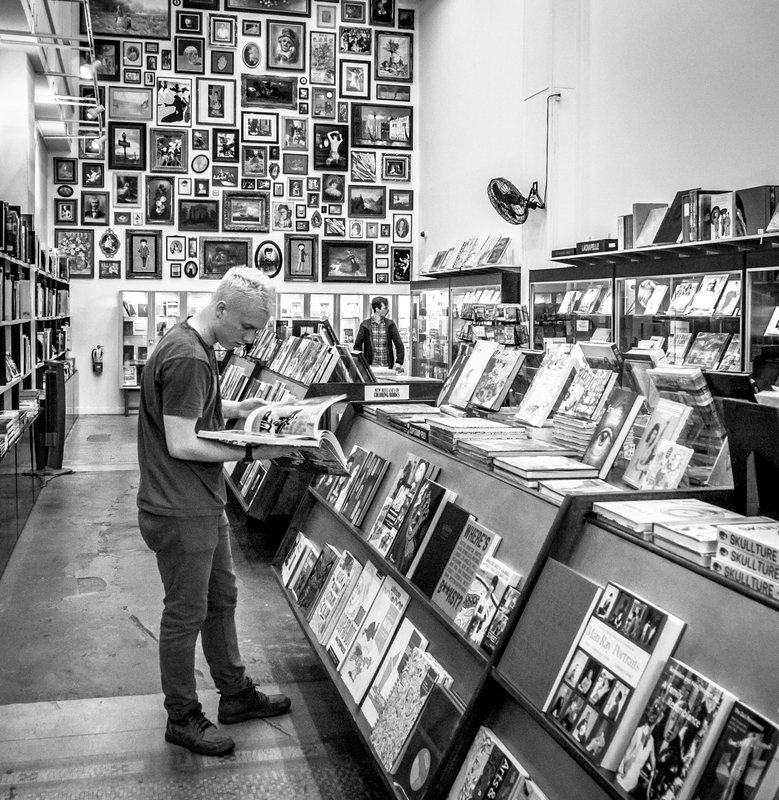 They’re doing something right here as it has now grown to be the largest independent seller of new and used books and music in California. Downstairs, you’ll find their art books in a separate room. 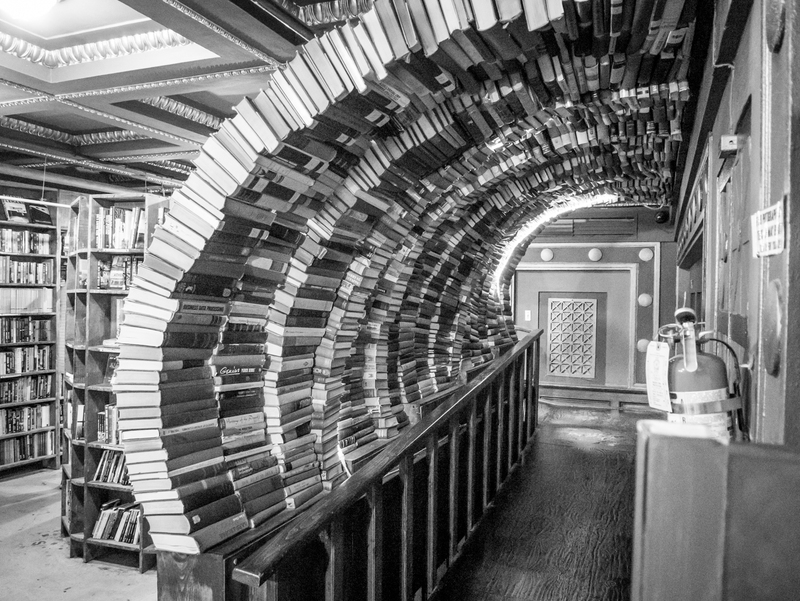 Upstairs you’ll want to wander through the photogenic stacks to see the book loop, old bank vault and book tunnel. In addition, there are three art galleries upstairs. I loved the recycled almost Steampunkish work of Dave Lovejoy. 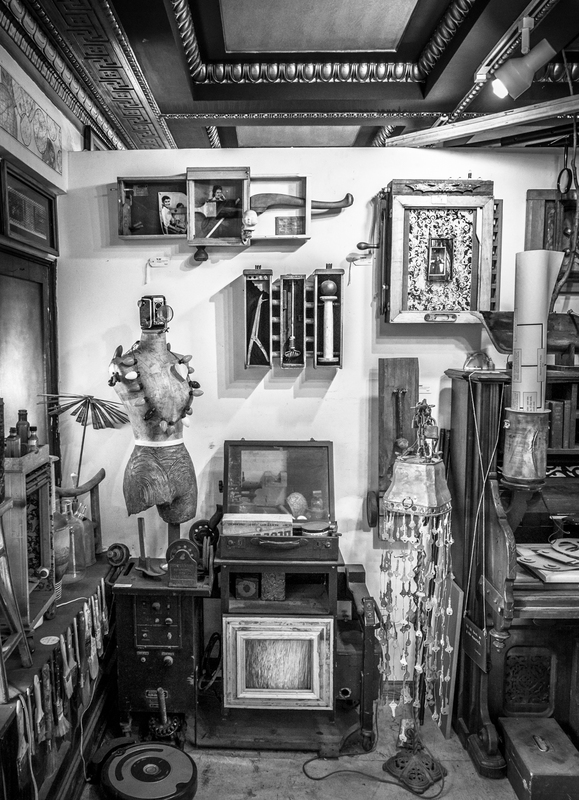 He’s got a killer studio/gallery overlooking 5th and Spring Streets below. We talked about his work for a while and he gave me some suggestions for less-well-known places to see in LA including MorYork and The Museum of Jurassic Technology. Great advice and very cool art. On our trip, I relied on memory rather than the map, so instead of just heading back up 5th Street to Pershing Square (our destination), we wandered down Spring Street. It turned out to be a good mistake, so I’ve included it on this walking tour. As you head south on Spring from The Last Bookstore, look for the various murals on the sides of buildings. These are captivating in their own right and can make great backgrounds for people shots. 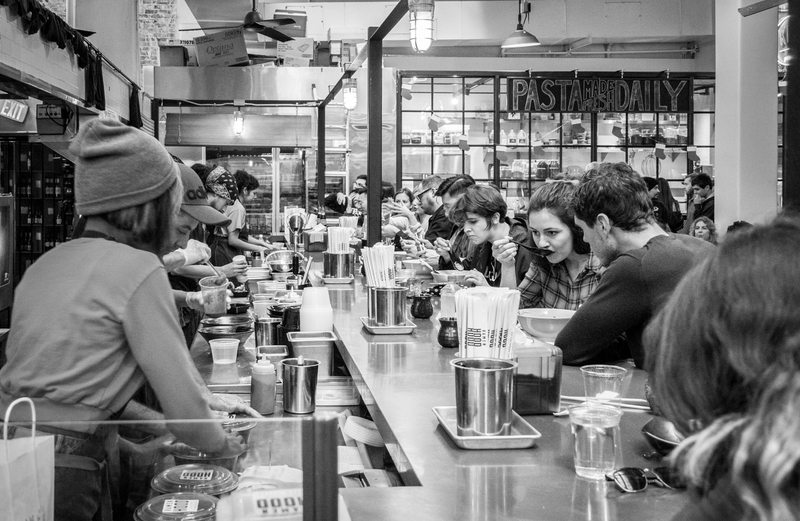 Along the way, if you get hungry (hey, it’s likely been at least an hour since The Grand Central Market! ), here are two options, both in the courtyard at 541 S. Spring (on your right). First, if you didn’t get your fill of Mexican food at the market, try Guisados. We didn’t eat there ourselves, but at 3 p.m., it was packed while every other taco place we passed (and there are many in this area) was empty at this time of day. Second, for a sweet treat, try Gelateria Uli (Point D on the map). Remember: In Italy, gelato isn’t a desert. It’s a snack. Need any other excuses? Keep going south then turn right on 7th Street. 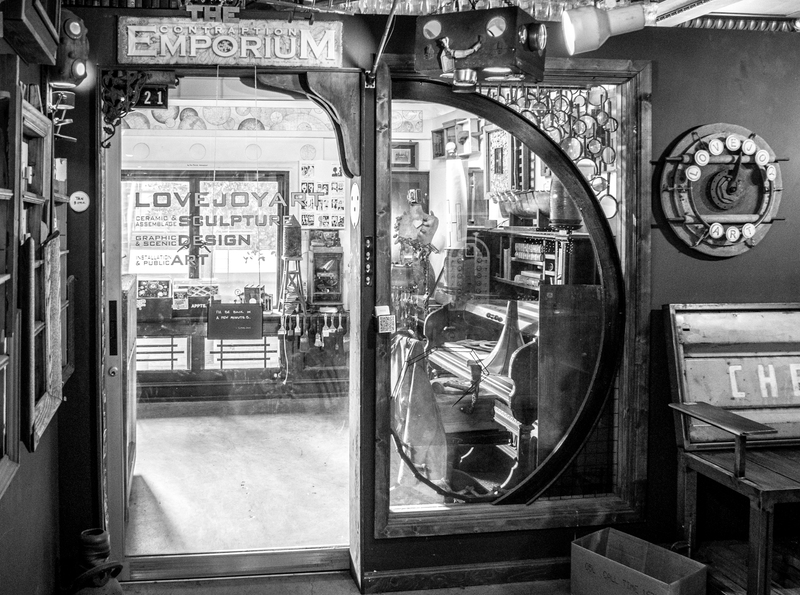 Take in a whiff of aftershave and shampoo as you pass Floyd’s 99 Barbershop (Point E) – or maybe get a quick haircut or shave if you’re in the mood. 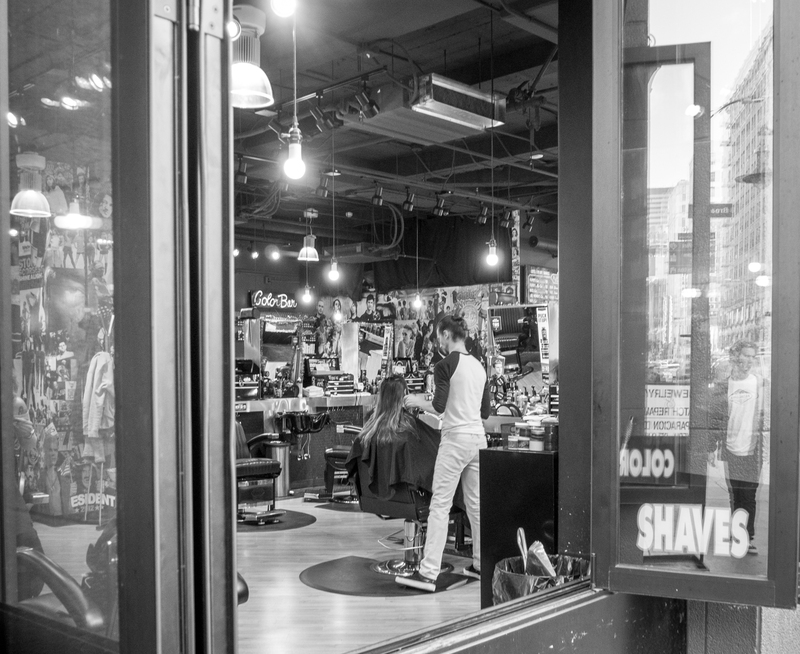 From a photographer’s perspective, you could get some interesting shots of the place and people getting their hair cut. Keep heading west up 7th and you’ll come to an alley past S. Broadway known as St. Vincent’s Court, (Point F on the map). It’s one of those places you won’t likely find on any tourist map, but it was, for us, a fun discovery of shops and Mediterranean cafés with outdoor seating and interesting signage tucked away from the main drag. The map, by the way, shows you going up to Hill, turning right and then making another right to get to St. Vincent’s court. That was a Google Maps issue. You could go that way but you’d be retracing your steps so just turn into the court as you pass it going west on 7th. There’s no signage, but it will look like the following photo. Follow the court to the end and make a left working your way through valet parkers with some fancy cars. You’ll emerge on Hill Street. Turn right and go down to W. 6th Street. From that corner (Point G), you have a nice shot of Pershing Square (see photo at the top of this page) and the downtown skyline. Cross over to Pershing Square (Point H). 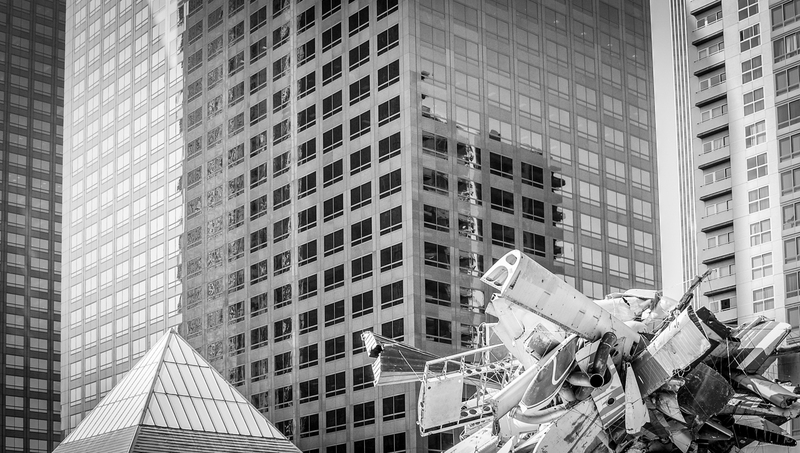 Pershing Square (at the bottom of the photo) and surrounding buildings. You can buy tickets to go to the top of the one on the left (see details later on). 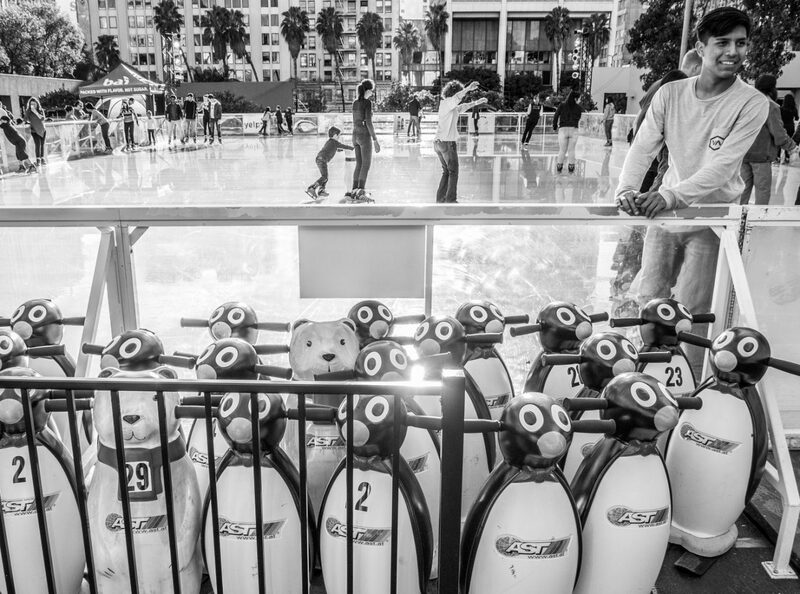 This mini oasis of green in the heart of downtown LA offers you a quiet respite or, in our case during Christmastime, the chance to do some ice skating. We passed on participating but watched kids struggling around the ice rink. You could see the ice melting in the 60+ degree weather three days before Christmas. From a photography perspective, look around at the various buildings. To the north, there’s an interesting roof garden. As we watched, a helicopter landed on one of the buildings to the west. Just another day in downtown LA. 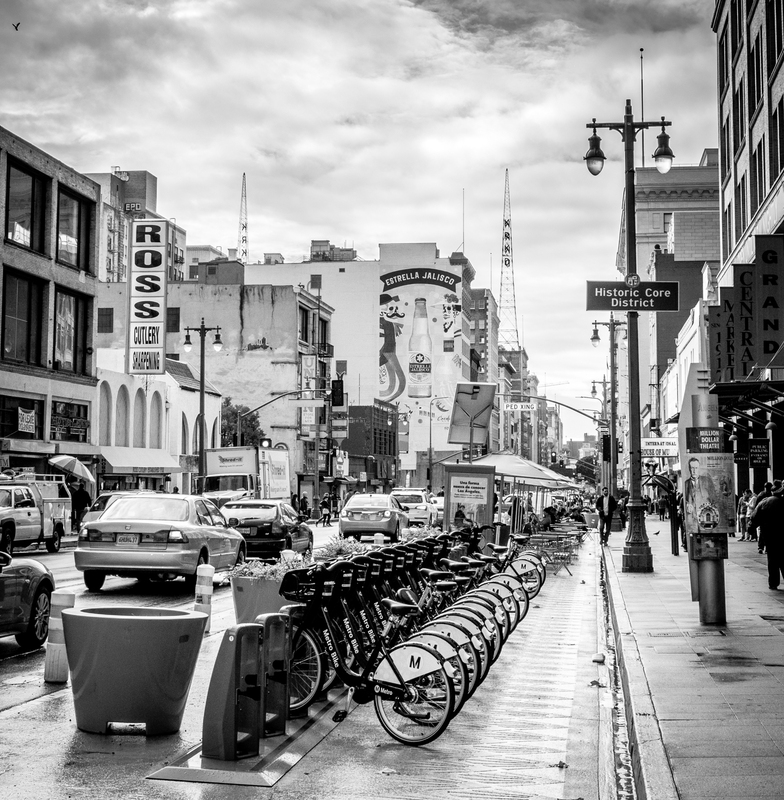 Your next destination is just across Olive Street from the west side of Pershing Square. 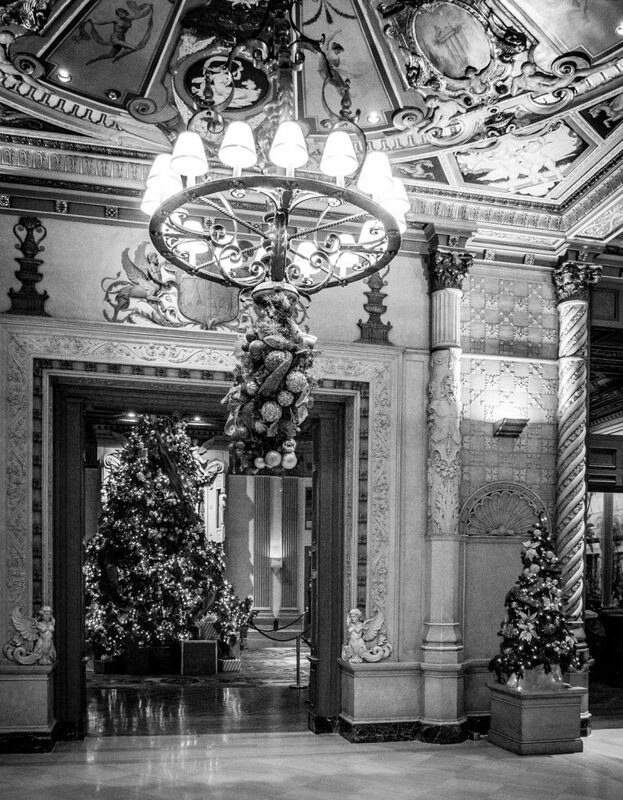 Enter the Millennium Biltmore Hotel (Point I and also Point A of the second part of the tour) through the entrance on Grand and marvel at the entry lobby. 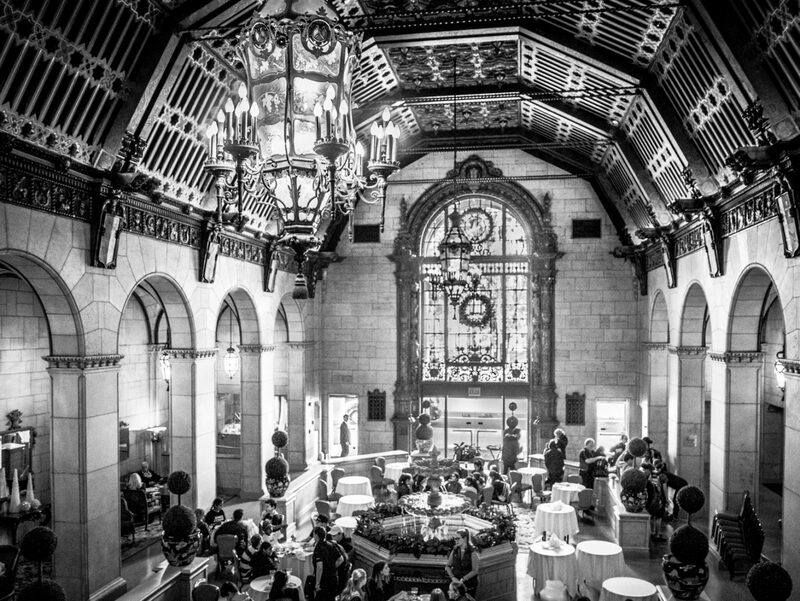 The Rendezvous Court (once the lobby) of the Millennium Biltmore is a great place to rest, grab a drink or take photos. If you want to take a break, this is a good place to do so. You could order a drink or just sit and watch the people and marvel at the ornate architecture. 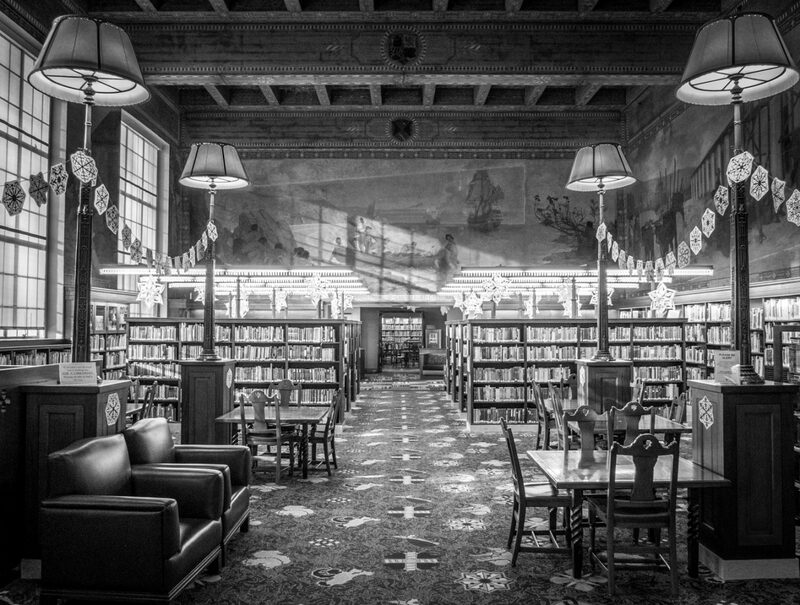 Photographically, there are multiple options throughout the public areas of the hotel. It’s fun just to explore and see what you find. 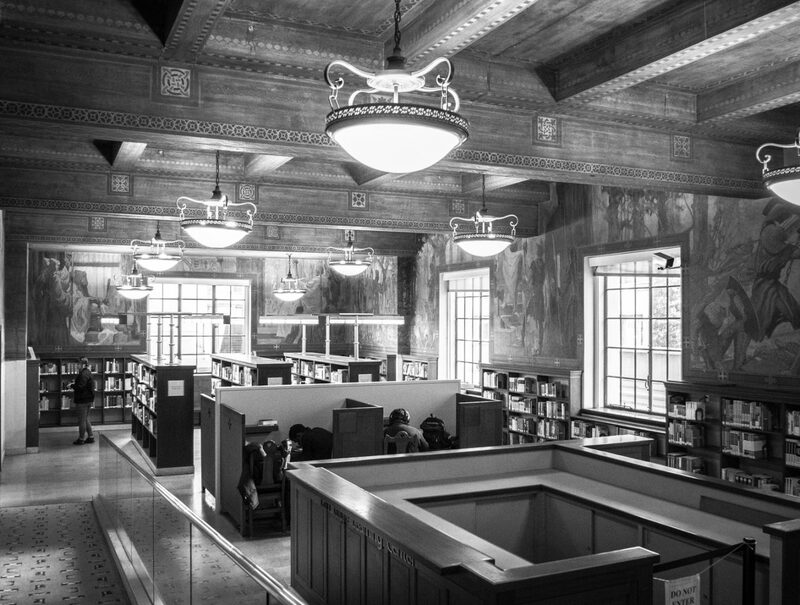 Pay attention to the details here in the children’s department including the murals, the ornate ceiling and even the carpet, where seemingly abstract patterns turn out to be figures found in the adjacent rotunda. The atrium’s vast space and colorful chandeliers make it a wonderful area to stop and take in. The international languages area has some amazing murals from the scenes of Ivanhoe. Be sure to check out the Maguire Gardens at the west end of the library before heading out and crossing 5th Street where you’ll go up the stairs (with the waterfall in the center) to the OUE Skyspace LA (Point C on the second half of the tour) ticket booth. We didn’t have time to go to the top of the U.S. Bank Tower building for views of LA. It’s also not cheap, but many people find it worth the price for the views and the chance to slide in the clear tube-like slide high above the city. From here, keep heading north and proceed up Hope Street till you get to W. 3rd where you’ll turn right and proceed down to Grand Avenue. If you’re a banking fan or want a quick glimpse into one aspect of California history, you can pop into the free Wells Fargo Banking Museum (Point D) there in the bank building on the corner of Grand and 3rd. Turn left on Grand and at this point, you have some choices to make. Down Grand a half block or so and across the street you’ll see The Museum of Contemporary Art (MOCA, Point E). If you continue a block north on Grand, you’ll hit The Broad (Point F). 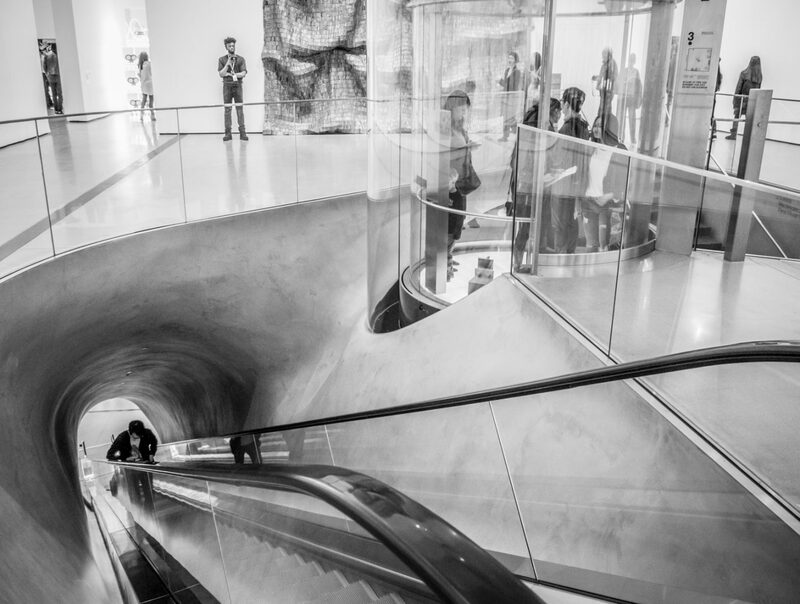 Both are excellent contemporary art museums with very different displays. 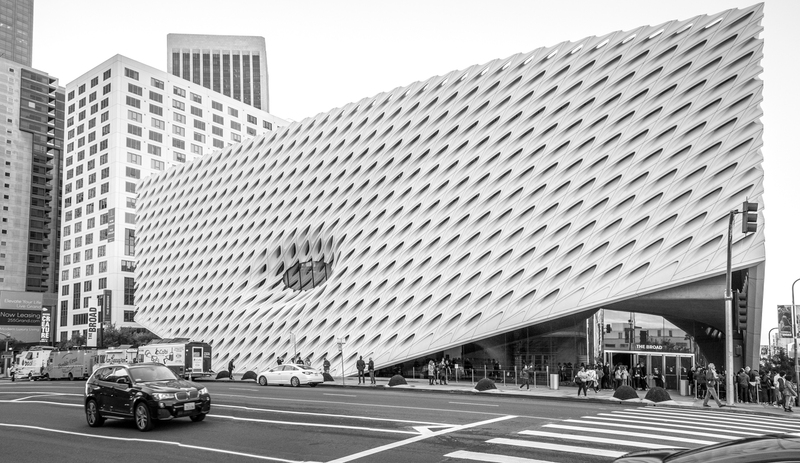 But here’s the challenge: The Broad is relatively new and thus, it is currently extremely popular. The good news is it is free. The bad news is that if you want a guaranteed entry time, you need an advance reservation and right now, the dates are booked about three weeks out. You can just show up, but you’ll need to wait in line (which could take well over and hour or two). If you go this more spontaneous route, arrive as early as possible. That might mean doing this whole walking tour in reverse so that you’re starting here and ending at the Bradbury Building, but that won’t matter. 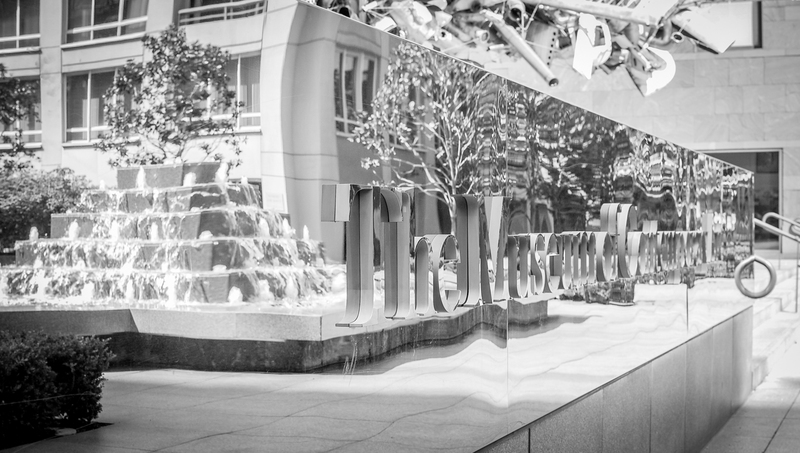 Reflections of the nearby fountain caught in the MOCA sign. 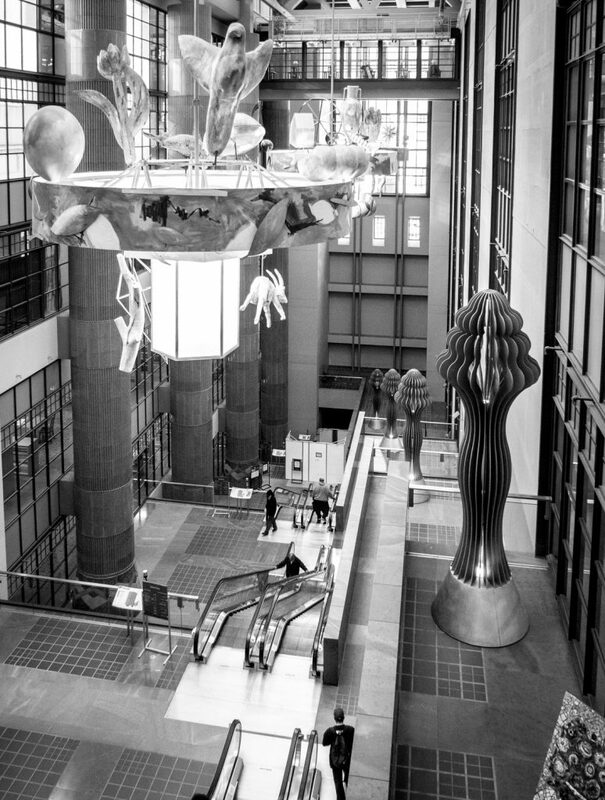 The pyramid on the left is an icon of MOCA and the large sculpture on the right sits outside the main entrance. Finally, keep going another block up Grand and you’ll see the Frank Gehry designed Walt Disney Concert Hall (Point G), home of the LA Philharmonic. Tours are available daily, both guided and self-guided audio tours. Or better yet, time it so you arrive and can attend one of the many concerts here. 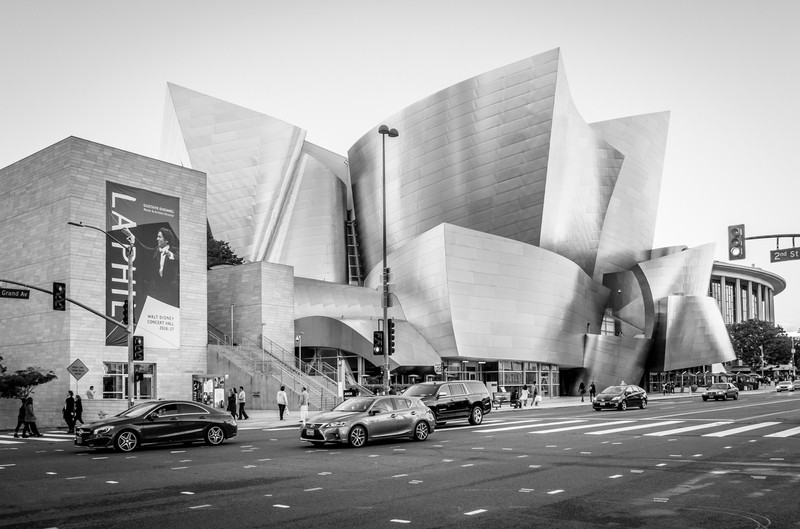 Because of the reflective nature of the exterior of the Walt Disney Concert Hall, the light dramatically affects how the building appears. Thus, if you can and are interested in photographing the place, visit it several times throughout the day for different angles and a different feel. This was taken at a Christmas concert in 2013 but it gives you a sense of the inside of the hall. 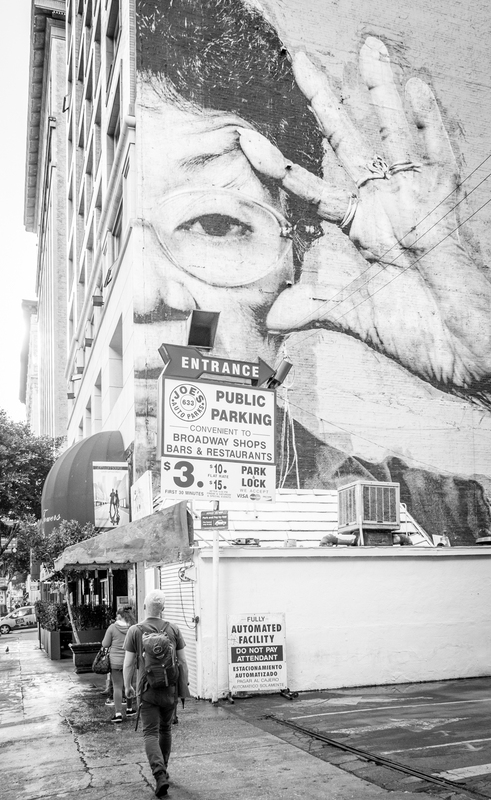 This concludes our photographer’s DIY walking tour of downtown LA. But if you have additional time, here are some other highlights that are all within walking distance from here that are all popular and photogenic. You’d be hard pressed to do all these together with the above walking tour in one day, but you could do the above tour on one day along with a few of the following and then do the rest a second day. 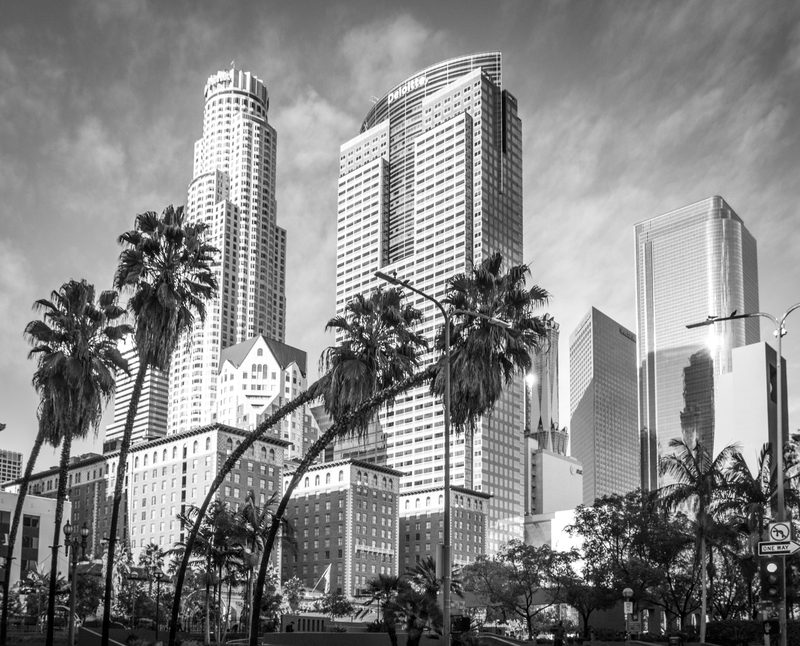 We have looked at the popular spots in downtown LA, but these should just be your starting points for further exploration. There is much to see and do. Take your time. As you can see from the above photos, some are better than others. That’s because many were taken hastily, more as snapshots than well-planned images. Taking your time allows you to view a subject from multiple perspectives and to figure out how you might capture it in a fresh way. Bring a wide angle lens if you have one. I came with a 28-280 mm (equivalent) lens. I would gladly have foregone the telephoto for a wider lens since you’re in tight situations. Use panoramas. 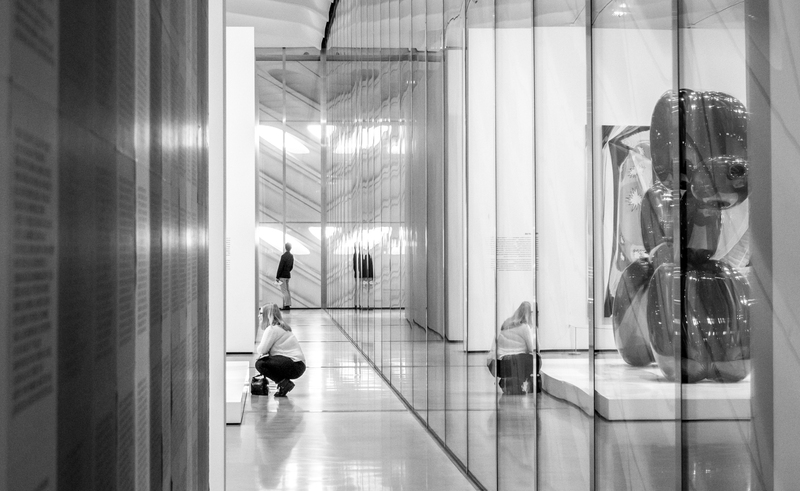 The shot of The Broad, the interior of the Disney Concert Hall and the Rotunda at the Central Library were all stitched together from several shots. This allows you to make up for not having a wide angle lens in some situations. Just remember that you can shoot panoramas vertically too, as shown by the image to the right of the Bradbury Building. Plan on low-light scenarios. Most of the interior shots shown here were shot at ISO 3200. My camera starts to show noise if I go higher than that. Just be aware that you’ll need a fast lens, good image stabilization, a great low-noise sensor or possibly even a tripod to get clean images in these low-light conditions. Flash won’t help because you’re likely too far away from the subject matter for it to work. Time your exterior shots. By this I mean realize that in sunny LA, you’ll get a lot of shadow and glare during the height of the day. The only benefit to the bright midday sun is that for some buildings, the shadowy areas between buildings light up when the sun is directly overhead. Otherwise, save your outside shots for late in the afternoon if you can. Don’t worry about the people. Obviously, you want to be respectful when taking photos of people. But there are enough tourists around that the locals are used to seeing cameras. There are also enough people who live and work downtown so that you rarely feel like you’re taking photos of other tourists. You decide if you want to go for stealth mode or for asking people before you take a photo. Both have their place, but asking opens the door for some great conversations and additional insights as to places to see. Have fun. This is LA after all. Explore. Discover. Ask questions. Try new things. And most of all, realize that while millions of people have been here and taken shots of this city before you, this is still a discovery for you if it is your first time. So enjoy it. Make it yours. Finally, if you’re new to photography, check out my Beginner’s Guide to Making Awesome Travel Photographs. It provides everything you need to know to improve your travel photography.